The front desk staff is very knowledgeable and very helpful! The restaurants and gift shops are very high priced for the type of food and items that they serve and sell. The hotel is ok, it is a higher class old hotel. The housekeepers and the carpet cleaners need to learn to vacuum and extract the edges and corners of the carpets. I love the property overall. Very nice would stay again. Our room had plumbing issues, but the fixed the next morning. I brought my children to this same resort when they were little ones. Loved it so much that I had to bring my grandchildren to experience it as well. It changed immensely for the good. Calypso's night life I enjoyed very much. The scenery is what gravitates me to this resort. The only downside was an employee at the 24 hour cafe, made a sarcastic remark when i asked her for some change. Aside from that all other employees from the front desk to the room attendants were very welcoming. Good location and service. The hotel is clean. Only one thing I don't like is the water from the sink is bad smell. Hotel is in outlying area, lacking easy accessibility to other stores, shops, etc. My 9 yr old enjoyed the pool slide, outdoor ping pong, the video arcade and the shuffleboard at The Loft. The 24 Hr Cafe was very helpful - coffee/paninis on the way to the park and late night pizza when we arrived back at the hotel. The California rolls at the loft were not good at all - the rice was not properly cooked. Clean and spacious! Friendly staff for the most part. There was a lady working in Tower 2 at the desk who never looked up to greet people. She was on her phone every time we saw her, her head was down. Someone could have come in with a gun, and walked right by her. Very close to Disney and very affordable. Pool Is great and the choice of restaurants is good. I did not like that I had to pay $28 a day for a “resort” fee when its just a basic hotel room with only an outdoor pool. I also had to pay $10 a day for parking. I could have spent the same amount of money at the Embassy Ste and it includes FREE breakfast and FREE parking and nicer rooms. I would not stay here again but the rooms are ok if you’re only there to sleep, bathe & get out to the theme parks. The pool and grounds are visually appealing. The details became issues: Example: Tennis rackets we rented are falling apart. Rooms need updating, older carpeting, last era styling (dark wood), no updated power options in bedroom for device charging and older TVs without HDMI input. Not sure if we would stay here again as our digital family was limited. Thegrounds, pool and quick family friendly food options were great. The walking/running trails are very poor and kind of scary around the perimeter of the property. There is not much around the property and just to go get a phone charger you have to take a cab to a store. No poolside beverage/food service. The rooms are really nice and are very spacious. Good bars and restaurants. The pool area was very clean. Front desk staff were nice. Located 2.7 mi (4.3 km) from Orlando Vineland Premium Outlets, Caribe Royale All-Suite Hotel is within a 15-minute drive of other popular attractions like Aquatica. This 1335-room, 4-star resort has 2 outdoor pools along with a full-service spa and 3 restaurants. This resort is home to 3 onsite restaurants, perfect for a quick bite to eat. Savor a meal from the privacy of your room with 24-hour room service, or get a pick-me-up at the 2 coffee shops/cafés. For your convenience, a buffet breakfast is available for a fee. Guests can expect to find free WiFi and 46-inch an LCD TV with cable channels and pay movies. Beds sport premium bedding and the bathroom offers a hair dryer and designer toiletries. Other standard amenities include a sitting area, a microwave, and a coffee maker. Guests of Caribe Royale All-Suite Hotel have access to a full-service spa, 2 outdoor pools, and a children's pool. Parking is available for USD 10.65 per day (USD 15.98 per day for valet parking), and there's also limo/town car service. The 24-hour front desk has multilingual staff ready to assist with concierge services, luggage storage, and dry cleaning/laundry. Other amenities at this spa resort include a fitness center, 3 spa tubs, and an outdoor tennis court. Greetings, Thank you so much for your continued loyalty and this wonderfully kind review. We so appreciate your business and love being your home away from home when you are in Orlando! We are glad to see you enjoyed the aspects of the Caribe Royale that make us unique including the beautiful grounds, dedicated, welcoming staff and Calypso’s Pool Bar & Grille which blends island fun with poolside relaxation and a unique Floribbean Menu. We're disappointed to hear that your experience was tarnished by your interactions with a member of our team. Please know that we are dedicated to providing only the most attentive and courteous service to each individual staying in our hotel so we'll be sure to discuss your concerns moving forward. We sincerely apologize for this occurrence. If allowed a future opportunity, we will exceed your expectations and deliver to you the service and hospitality that we have built our reputation on. Greetings, Thank you for taking the time to leave us such a wonderful review! It seems you had a fantastic time and we are so honored to have had the opportunity to provide this for you! We are looking forward to the pleasure of welcoming you back soon! Greetings, Thank you for taking the time to review your stay at the Caribe Royale! It is delightful to know you had a positive experience. We are glad you enjoyed our activities and our wonderful staff. We are proud of our team for their efforts and glad to know they left a lasting and positive impression. We are grateful for your business and hope you will consider staying with us again in the near future! 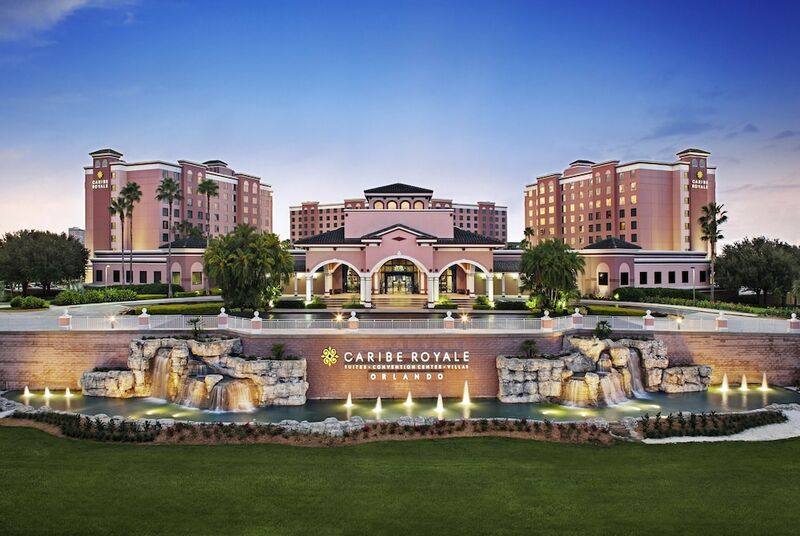 Greetings, Thank you for choosing the Caribe Royale and leaving an overall positive review. Actually our hotel is in a prime location, just 1.5 miles from Disney and centrally located to other area attractions. We also offer a free shuttle that goes to Disney Springs, which offers multiple dining and shopping options and Orlando Premium Outlets for shopping. Also in addition to our delicious onsite dining options, there are a multitude of dining options and shops a short, inexpensive Uber or Lyft ride away. We hope on your next visit you will explore these options and see how convenient our location really is! Greetings, Thank you for your perfect review! We are glad you chose to stay with us and that we were able to meet all of your expectations! We pride ourselves on having leisure opportunities for those of all ages and we are excited to hear we delivered that value to your family. We are also pleased to hear you enjoyed our tropical pool area featuring cascading waterfalls and a 75 foot waterslide! It's wonderful that you enjoyed Café 24 which offers convenient 24-hour dining, seven days a week. We do apologize that the California rolls were not up to par. We hope this was brought to the attention of your waiter so it could be corrected. We want everything about your stay to be flawless. We hope to welcome you back for another incredible vacation soon! Greetings, It was a pleasure hosting your stay at the Caribe Royale! Thank you for taking the time to post a positive review! We’re already looking forward to welcoming you back! Greetings, Thank you for choosing the Caribe Royale and taking the time to post an overall positive review. We are happy you enjoyed our clean, spacious resort. Our dedicated staff takes pride in keeping our beautiful hotel clean and we are glad you noticed. We do apologize for the behavior of the woman in Tower 2. The people at the desks in the towers are not hotel employees. They work for a third party company, Wyndham. Our management team cannot assist much when it comes to a third party company, however we are happy to reach out to the third party management to let them know of the unacceptable behavior of their employee. We look forward to serving you again soon! Greetings, Thank you for choosing the Caribe Royale! We are so pleased that your stay was worthy of a perfect review! We sincerely hope we get to welcome you back for another perfect visit in the future! Buffet breakfast is available for a fee. The resort has 2 outdoor swimming pools and 3 spa tubs. A children's pool, an outdoor tennis court, a waterslide, and a fitness center are other recreation options. Property will contact guest prior to arrival with additional check in instructions. For more details, please contact the property using the information on the reservation confirmation received after booking. The following credit cards are accepted: American Express, Carte Blanche, Diners Club, Discover, JCB International, Mastercard, Visa, and Union Pay. Reservations need to be made in advance for massage services and spa treatments. Contact the resort at the phone number listed on your booking confirmation.